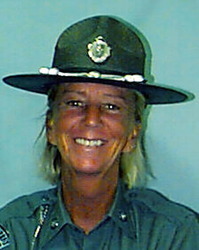 Trooper Ellen Engelhardt succumbed to injuries sustained eight years earlier when her patrol car was struck by a drunk driver on Route 25 in Wareham. Trooper Engelhardt was parked on the shoulder of the road when the drunk driver struck the rear or her vehicle at nearly 90 mph. Her injuries left her in a vegetative state and she was unable to speak or communicate. The driver was sentenced to 2.5 years in prison for drunk driving after the initial accident. In September 2011 he was charged with vehicular homicide as a result of Trooper Engelhardt's death. In January 2014 he was convicted of vehicular homicide and sentenced to three years probation. Trooper Engelhardt had served with the Massachusetts State Police for 23 years. She is survived by her daughter.